Montreal, Canada – The Targray Battery Division is showcasing its new line of advanced materials for lithium-ion cell manufacturers at the 2018 edition of The Battery Show Europe, running May 15-17 in Hannover, Germany. Drawing on three decades of experience in high-tech industries and an international sourcing network, the Battery Division offers a comprehensive range of advanced materials aimed at enhancing the safety, efficiency and cost-effectiveness of next-generation battery and energy storage technologies. The company’s product portfolio includes cathode and anode materials, current collectors, separators, electrolyte, binders, coated electrodes and packaging materials for various cell geometries. It also supplies production equipment for commercial, pilot line, and lab-scale lithium-ion battery manufacturing. 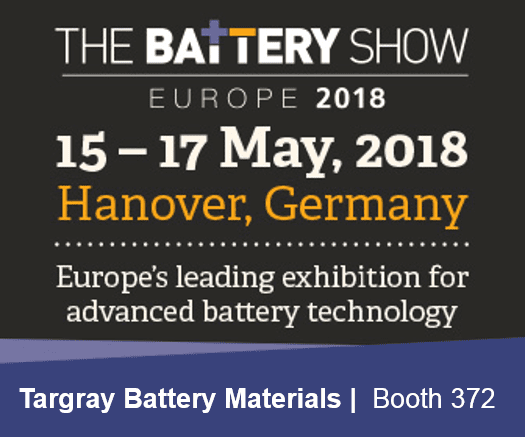 Battery Show Europe visitors can meet the Targray team, discuss their project requirements and learn more about the company’s latest products and solutions at stand 372. To schedule an on-site meeting, guests are invited to contact the Battery Division. The Battery Show is Europe’s largest trade fair for advanced battery technology. More than 300 manufacturers and service providers from across the supply chain will display thousands of design, production and manufacturing solutions, including battery systems, materials, components, testing and recycling, for industries including automotive, utilities, renewable energy, grid, power tools and electronics. This free trade fair is an opportunity to source the latest energy storage solutions, helping to reduce costs and improve the performance of applications. In 2018, the expo and conference is moving to Hannover, Germany, in the state of Lower Saxony. The city’s automotive industry plays a crucial role in the state’s economy and the region is bursting with opportunity for the e-mobility and energy industry. Running parallel to the trade fair is the three-track, expert-led conference, delivering insight into key business and technical challenges while framing the commercial opportunities currently facing global OEMs, battery manufacturers, components providers, stationary storage systems and their supply chains. Find out more here.